The result is satisfied employees and customers, lower absenteeism and plus points for the company’s image. Logistics services of the highest standard CHI Deutschland has been specialising in freight handling for over 20 years. Its portfolio ranges from trucking and air freight security right the way up to check-in services for cargo and airlines. The logistics company is particularly active in locations with high levels of goods transport, such as Frankfurt am Main, Munich and Nuremberg. In CargoCity alone – Europe’s largest logistics hub located at Frankfurt Airport – CHI Deutschland handles around 550,000 tonnes of freight every year and operates ten halls, each covering an area of up to 8000 m². The logistics company owes its success to the advances it has made by incorporating the latest technologies, high quality standards and, in particular, its clear focus on its employees. Kai Domscheit, Managing Director of CHI Deutschland, explains: "We have about 1000 employees. As a family-run company, these employees are like members of our family." Ensuring optimum working conditions and occupational health and safety is therefore the top priority. Nevertheless, day-to-day operations presented the logistics provider with a number of challenges in this regard. The huge volumes of goods being moved meant high levels of dust occurred, which had a negative impact on both employee health and well-being. Adriano Fries, Technical Manager at the Frankfurt am Main site, describes the experience of many colleagues: "When we blew our noses, our tissues were black; and when we took a shower after work, the water also turned black." This provoked dissatisfaction among the workforce. As employee satisfaction plays an important role at CHI Deutschland, the management took it upon themselves to find a solution to this problem. However, this wasn’t the only reason to show the dust who was boss. Cleanliness in general is very important to the logistics company, as biometric sensors and sensitive equipment are in constant use, and dust deposits affect their accuracy and the way they function. What’s more, the regulations are increasingly being tightened and audits are becoming ever more rigorous and comprehensive. Domscheit added the following: "When iPhone prototypes pass through our cargo halls, for example, we must always be able to say that we are working with the highest standards available." Image was also another aspect to consider: an impeccable, "dust-free" appearance for the halls makes a good impression among current and prospective customers alike and promotes the good reputation of the company. A solution therefore had to be found which reduced the dust in the air, while at the same time lowering the build-up of dust in the halls. When it comes to finding solutions, CHI Deutschland follows a best-practice philosophy in all areas.. Managing Director Domscheit explains: "We always endeavour to trace the best products on the market and put these through their paces." 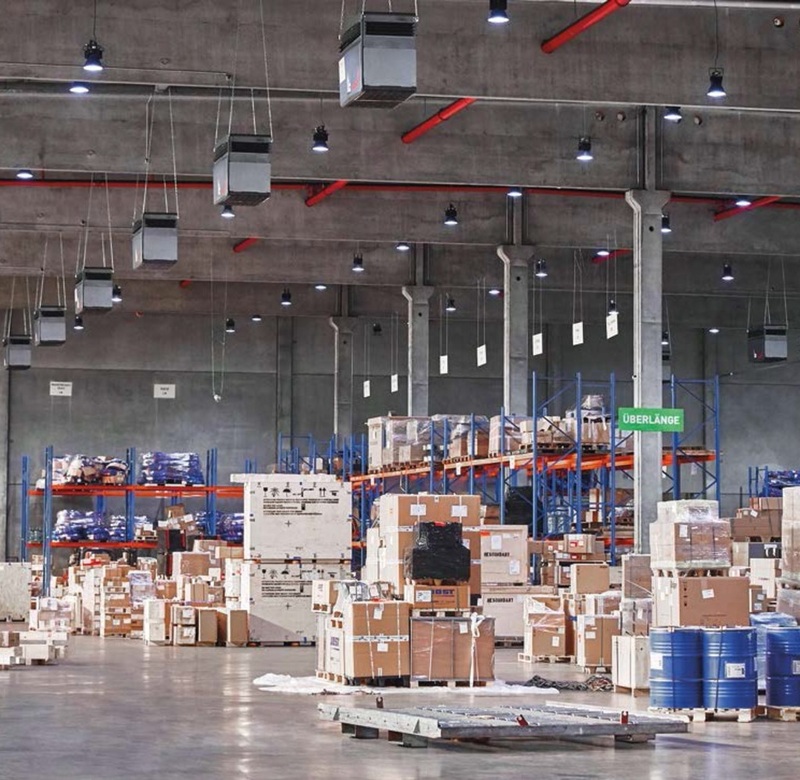 The logistics company discovered the industrial air cleaning systems offered by Zehnder Clean Air Solutions through one of its largest customers, as they had used the systems to reduce the concentrations of particles at their site. This aroused CHI Deutschland’s interest but they weren’t convinced just yet, as the way the system worked and the results didn’t appear to fully meet their needs. Armin Gläßer, Regional Manager of Zehnder Clean Air Solutions, held in-depth discussions with the company to create a specific requirements profile and some time later presented a solution that was precisely tailored to the conditions of the logistics provider. A pilot project was initiated, and industrial air cleaning systems from Zehnder Clean Air Solutions were installed in one of the halls. The systems use intelligent technology to filter fine and coarse dust particles effectively from the air before they can be inhaled or settle on valuable goods or machines. The particular challenge for the Zehnder Service team was that all the components had to be installed while the halls were in use, as they are in operation 24/7, 365 days a year. The excellent preparations that were made for this project meant that this requirement could be met. Fries states the following: "When Zehnder employees come to us, they are always finished in no time at all. We don’t even notice that they are here." The newly installed equipment configuration was put through its paces in practical tests for an entire year and six employees were chosen to regularly report on their experiences. Warehouse Manager Antonio Azevedo reports: "It was very easy for us to make a comparison, as the air cleaning systems were initially only installed in one hall. When we switched from one hall to the newly equipped hall, we noticed the difference immediately: the air is fresher, cleaner and you can breathe more easily. Other members of staff came up to me and even asked, "What’s going on here?" The result: reduced absenteeism, higher standards, optimised appearance Black shower water and sooty tissues are now a thing of the past. Employees can breathe more easily at work and feel better. A further welcome effect is that there is less absenteeism. Even during daily processes, the results are clear to see. Whereas some equipment had to be cleaned on an almost daily basis before the air cleaning systems were installed, this is now only necessary every three to four days. In addition, measurements showed that the level of dust has decreased by up to 76%. These figures can also be backed up by practical experience. The Technical Manager added: "When maintenance was performed on the systems, almost 70 kilograms of dust were removed – 70 kilograms that no longer enters the lungs of the staff." The results have won over the management and workforce in equal measure. When the staff asked the managers to install the air cleaning systems in the other halls too, they didn’t take much persuading. Gradually, the high-performance equipment from Zehnder Clean Air Solutions has been installed in four additional halls, and plans are under way for more. Domscheit describes the overall response to the Zehnder project in a nutshell: "Our employees are more content and more motivated. Our company image has also definitely improved. Zehnder has therefore been a huge success."